Today went pretty well running-wise, and because I logged a tough 15 miles, I decided to treat myself to some liquid gold, Ten FIDY. Oskar Blues Brewery hails from the great state of Colorado and produces a number of mouth-watering beers, which until now, have been difficult to track down in NorCal. Previously, I've had to stock up while visiting my mom in Massachusetts, but thankfully the local Whole Foods has my back. Keep an eye out for it over the next couple months, as it's only released in the fall. This is seriously one of my favorite beers. I'm a sucker for thick, boozy imperial stouts, and Ten FIDY doesn't disappoint. When I first cracked the can open (canned beers CAN be good!) sweet roasted malts slapped me in the face. It pours a deep black, viscous like motor oil, with a one-finger, mocha colored head. The nose is out of control in the best possible way. Huge amounts of roasted malts intermingle with dark chocolate, making for one of my favorite smelling beers. There's something reminiscent of ripe raspberries mixed with dark stone fruit. Sipping on this is just as pleasurable as the smell. Loaded with dark malts and grains, this heavy-hitter coats your mouth and lingers. The 98 IBUs (a way to measure the bitterness of beer) are hidden surprisingly well by sweet caramel and are mostly noticeable in the finish. Touting a huge 10.5% ABV, Ten FIDY goes down way too easy. All the more reason to drink it up while it lasts! The flavor profile becomes more pronounced as it warms, so don't be afraid to let it sit for 15-30 minutes. 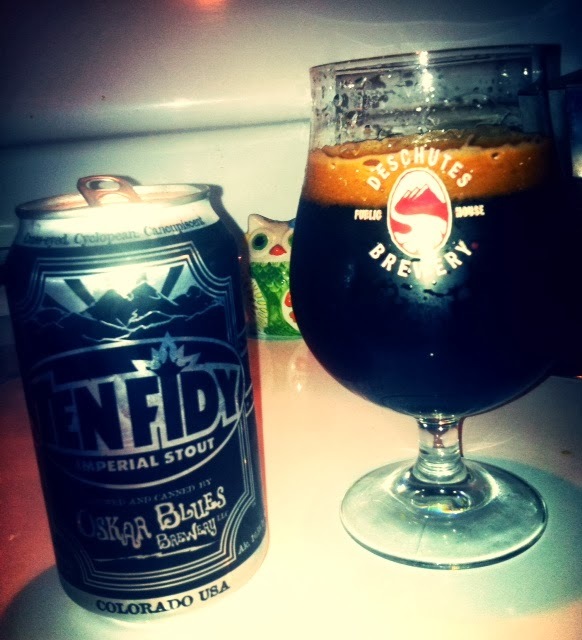 If you enjoy stouts, specifically roasty, thick ones, then do yourself a favor and find Oskar Blues Ten FIDY. It's a delicious dessert beer and pairs well with salty and sweet treats alike! Looks like a tasty brew! I don't know if I could handle that ABV, but I'd give it a shot.